Adilabad, January 10, (way2newstv.in):National Highway in Adilabad District Many of the disadvantages are often on the road that is completed seven years ago. Due to the many faults in the four-tier road construction built within seven years, there are accidents. Rs 62.55 crore has been sanctioned for construction of underpass, sleepless and busbare where the National Highway Authority is required. The tenders are called for the construction of these and we will take steps to start work. Central lighting and side lighting will be established soon across the national highway. Authorities have identified the underlying passes, sleep roads, side roads, and the lack of a busbase because of the accidents. A member of Parliament, G. Nagesh, National Highway Authority (NHAI) on defects in national road construction, suggested that steps should be taken without accidents. Respondents have made proposals to correct the shortcomings and take necessary structures. The Center has sanctioned Rs 62.55 crore for construction and bus services at the national highway. As a result, the national highway journey in the district is going to be safe. There is a 80-km highway in National Highway. This road was extended to four straight roads seven years ago. The recent road safety committee meeting was discussed at the meeting of the National Highway Expansion Operations (NHS) in the past as it did not have supervised deficiency and no safety measures in place. Considering the dangers of the year, the authorities identified 12 casualties. MP G. Nagesh has been specially focused on the faults in the national road construction. The National Highway Authority contacted officers and brought them to the road examination. He showed them the places of accidents. Correcting technical errors on the highway and asking for measures to take place without accidents. To this end, the proposals for the creation of underpass, sleepprods, side roads and busbars have been prepared by the officials who have responded to this need. In the case of grant of funds, the MPs have been asked to give the necessary funds to the authorities, along with the Union Ministers. 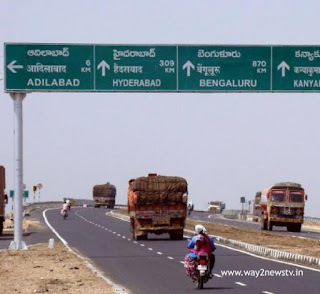 The central government, which responded to Adilabad, has sanctioned Rs 61.96 crore for various constructions in the National Highway in Nirmal District. Undas, at Nirmal Zon Sone at Rs 21.22 crores at Gudihatnur Bastand with Rs 11.47 crores will be under construction. The bridge is technically repaired at the Mandal Mandalagam along with these. Jainath Mandalam Bhoraj Exodd, Adilabad Mandal Jadadpur Export, Sattagam Exodd Road, Second Road Road and National Roadway Sleep Prots and Side Roads will be constructed. Besides these, the bail bays will be set up at Kamaki, Powai, Mundagoda, Thalmagunda Mandalam, Devapur, Vagupur, Gudihatnur Mandalam Makalgandi, Naradigonda Mandal, Lakkampur, Kishnappur, Roalmamada and Burgupalli along the National Highway. Rs 29.86 crore has been sanctioned for this. With their constructions, the people of the villages will be provided with comfort. People were faced with difficulties due to lack of underpass in front of the Gudihatnur Bastand. Going beyond the road to Nirmal. The underpass is here to prevent accidents.